France, Germany, the United States and other Western countries called on China on Tuesday to close down political re-education camps that Uyghur activists and human rights experts say hold one million Uyghurs and other Muslims. The United Nations Universal Periodic Review (UPR) began its assessment of China's human rights record amid a global outcry over the mass incarceration of an estimated one million Uyghurs and other minority ethnic Muslims in "re-education camps" in China's Xinjiang Uyghur Autonomous Region. 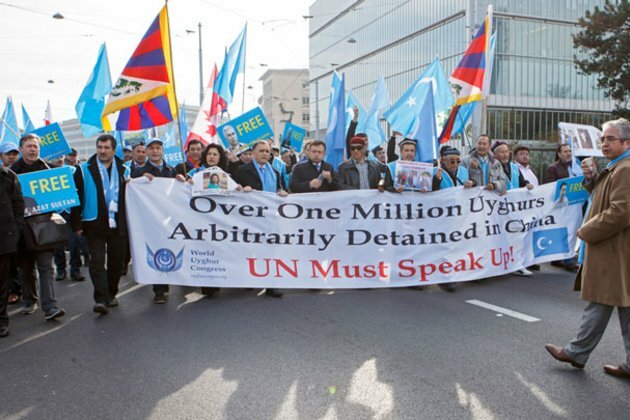 While as many as 1,000 Uyghur and Tibetan protesters and supporters gathered outside the Geneva forum, which reports on alleged violations in each U.N. member state every five years, 13 countries raised concern about the camp program, with many calling on Beijing to shutter the facilities. "We are alarmed by the government of China's worsening crackdown on Uyghurs, Kazakhs, and other Muslims in the Xinjiang Uighur Autonomous Region," U.S. charge d'affaires Mark Cassayre was quoted by Reuters news agency as saying. Beijing should "halt massive imprisonment" and "guarantee freedom of religion and belief, including in Tibet and Xinjiang," French Ambassador Francois Rivasseau said, according to a Reuters report from Geneva. The camps were criticized by Australia, Britain, Canada, Belgium, the Czech Republic, Finland, Germany, France, Iceland, Ireland, Sweden, Switzerland, and the United States. At a debate at the Geneva UPR-which reports on alleged violations in each U.N. member state every five years and reviewed China's record on Tuesday-China rejected the criticism, arguing that Beijing protects the freedoms of its 55 ethnic minorities and that its critics were driven by politics. Chinese Vice Foreign Minister Le Yucheng told the council that China's establishment of "vocational education and training centers" in Xinjiang were part of a "preventive counter-terrorism initiative" aimed at helping to free the minds of people affected by extremism. "Based on the needs of the fight against terrorism, Xinjiang has set up teaching and training institutions to prevent them from becoming terrorist perpetrators and victims, rather than waiting for these people to become terrorists who endanger others and society, and then suppressing them and wiping them out," Le said. Reuters quoted another Chinese delegate as saying that authorities were "providing free-of-charge vocational training with a diploma after exams" to those who had been "coerced or lured" by extremist groups. But World Uyghur Congress spokesman Dilxat Raxit said Beijing's submission to the U.N. rights review was a highly distorted version of reality. "If China believes that these are truly only vocational training centers ... then it should have no fears about the international community visiting the area to conduct independent investigations." Washington-based lawyer and Uyghur activist Nury Turkel rejected China's intervention as a "classic" example of a tactic by Beijing to "deny, conflate and confuse while playing the victim." "This is what the guilty party has often done to justify wrongdoings while never admitting mistakes and shifting the blame on others," he told RFA's Uyghur Service. "How would engaging in modern-day human engineering, internment of a large chunk of the population in Nazi-style concentration camps, creating a hell-on-earth-like environment outside the camps ... and criminalizing the entire nation based on ethnicity and religion be someone else's fault?" While Beijing initially denied the existence of re-education camps, the Uyghur chairman of Xinjiang's provincial government, Shohrat Zakir, told China's official Xinhua news agency last month that the facilities are an effective tool to protect the country from terrorism and provide vocational training for Uyghurs. China's state media have followed Zakir's remarks with a massive propaganda campaign promoting the camps, while foreign reporters investigating Xinjiang have reported constant harassment by authorities. Addressing the protestors in front of the UN office in Geneva, Dolkun Isa, president of the Munich-based World Uyghur Congress, said: "Everything that makes us unique is under attack by the Chinese government. We have no freedom of religion, no linguistic rights, no freedom of expression or assembly. Our entire ethnic group is being targeted by campaign of control, assimilation and social re-engineering." "Don't let us suffer and die at the hands of the brutal and violent Chinese government. We demand the international community for action. The world is watching. The Uyghurs are watching. The international community must act!" The advocacy groups Free Tibet and Tibet Watch said nine countries had raised the issue of Tibet, urging China to respect for Tibetans' rights to freedom of religion and freedom of expression. They also called for the release of political prisoners, including Tibetan language advocate Tashi Wangchuk, who was jailed for five years for allegedly "inciting separatism." "Today we have seen a number of countries take the vital step of speaking up for Tibet at the United Nations. International pressure works. That is why China has gone to such extreme lengths to cover up its human rights abuses in Tibet and why it consistently tries to intimidate countries that make even the mildest criticisms of these abuses," Free Tibet and Tibet Watch director Eleanor Byrne-Rosengren said in an emailed statement. The Associated Press quoted Human Rights Watch (HRW) as saying the U.N. review showed the contrast between Beijing's view of its human rights record and "the grim realities." "China's efforts to whitewash its record have failed to convince a growing number of states who recognize China's deliberate and systemic abuses, and suppression of dissenting voices, can no longer be ignored," John Fisher, HRW's Geneva director, said in an emailed statement, according to the AP. Reported by RFA's Mandarin Service and by Alim Seytoff for the Uyghur Service. Translation by Luisetta Mudie and by Alim Setyoff. Written in English by Paul Eckert.